The T-34 had well-sloped armour, a relatively powerful engine, and wide tracks. The initial T-34 version had a powerful 76.2 mm gun, and is often called the T-34/76. In 1944, a second major version began production, the T-34/85, with a larger 85 mm gun intended to deal with newer German tanks. The German Tiger I tank appeared on the Eastern Front in late 1942, as a response to the T-34. Soviet firing tests against a captured Tiger in April 1943 showed that the T-34’s 76 mm gun could not penetrate the front of the Tiger I at all, and the side only at very close range. An existing Soviet 85 mm antiaircraft gun, the 52-K, was found to be very effective against the frontal armour of the Tiger I, and so a derivative of the 52-K was developed for tanks. In 1943, T-34 production had reached an average of 1,300 per month; this was the equivalent of three full-strength Panzer divisions. By the end of 1945, over 57,300 T-34s had been built: 34,780 T-34 tanks in multiple variants with 76.2 mm guns in 1940–44, and another 22,609 of the revised T-34/85 model in 1944–45. 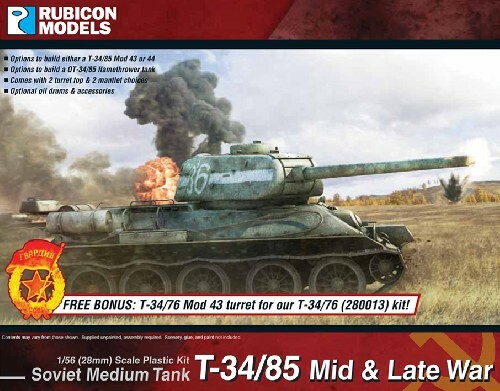 With this model kit, you can assemble the T-34/85 into either a Model 1943 or 1944 version of the tank. It comes with 2 turret top and 2 mantlet choices with oil drums & accessories options; and can be built as an OT-34/85 flamethrower tank as an option.